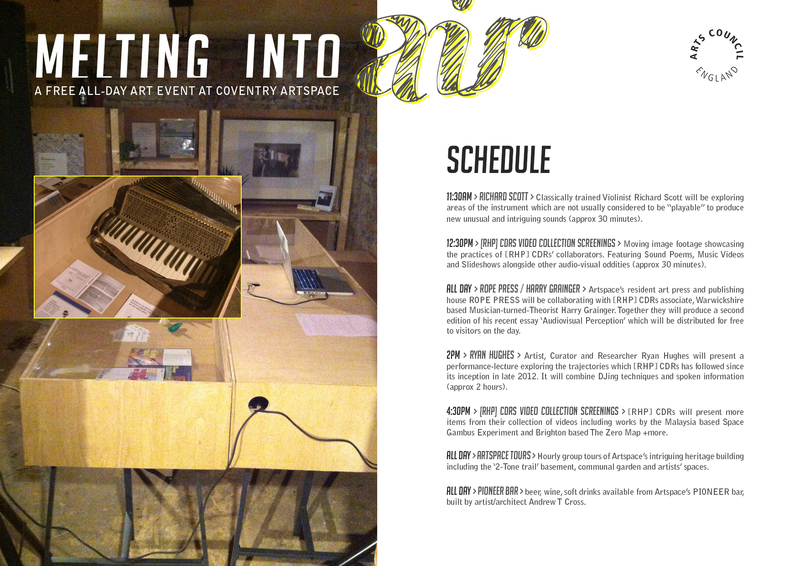 We’re working with Coventry Artspace and ROPE PRESS to present a free all-day art event in Artspace’s intriguing cultural heritage building on Saturday 3rd May. Presented in association with the Mead Gallery’s ‘Mystery Bus Tour’ of Coventry’s Cultural and Industrial past (now fully booked) to coincide with Jeremy Deller’s exhibition All that is Solid Melts into Air, the event will feature live performance, video, text, riso printing and tours of Artspace from 11am until 6pm. Following our recent residency in the Artspace basement (one time 2-Tone music rehearsal space, former Friends’ Meeting House and police social club), we will continue our investigation into the spaces between contemporary art and experimental music throughout the day. We have developed a strong relationship with Artspace’s building and team and much of the work presented during this event will be more fully resolved versions of things that were started during our recent group residency in Artspace’s basement. This event is taking place with thanks to Arts Council England and Coventry City Council. 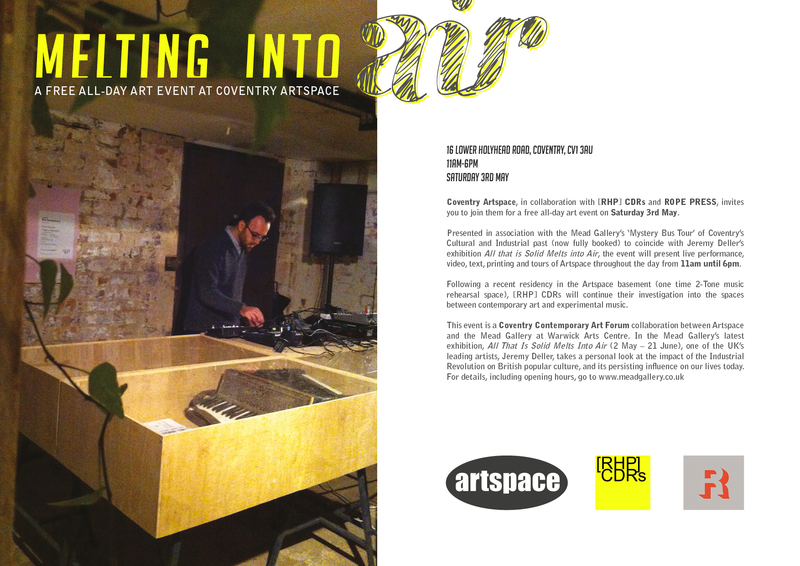 It is a Coventry Contemporary Art Forum collaboration between Artspace and the Mead Gallery at Warwick Arts Centre. In the Mead Gallery’s latest exhibition, All That Is Solid Melts Into Air (2 May – 21 June), one of the UK’s leading artists, Jeremy Deller, takes a personal look at the impact of the Industrial Revolution on British popular culture, and its persisting influence on our lives today.